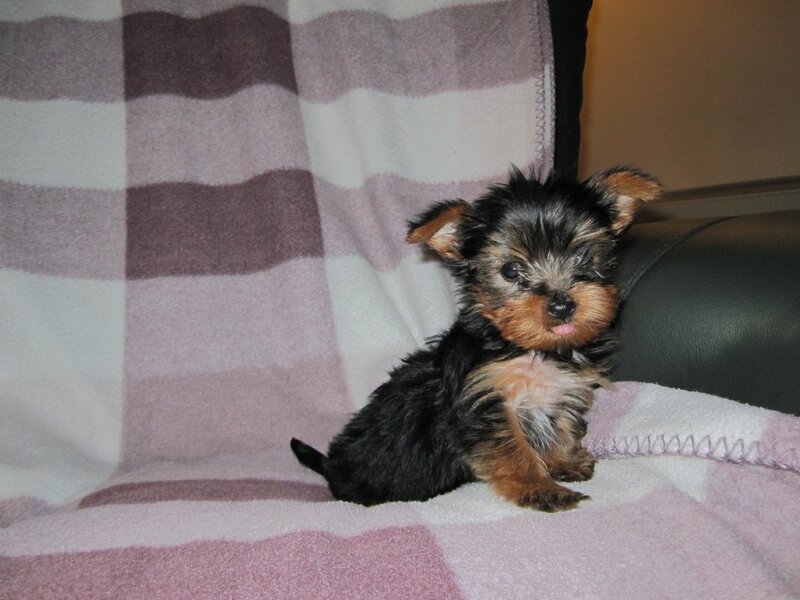 Description :Beautiful litter of full bred Yorkshire terrier pups. Ready to go now. These pups are very very small and cute as you can see from photos. Mum Missy is a beautiful little girl long silky coated full bred Yorkshire terrier. very sweet natured loyal and loving and a good little mum. Both parents are very small and are true examples of the Toy breed and also well loved and cared for family pets as well as great companions.. All my pooches share my home with me and can be viewed along side their pups. If you would like to be the proud owner of one of these beautiful pups.. Dad Mondlindi s snug fit pet name Buddy has over 20 champions in his pedigree bred from show winning lines. The Jankeri oz million and lots more He is an absolutely fab little stud dog. siring best litter of 10 beautiful tiny T cup and Toy size pups. so hopefully males will take after their dad and make grand little stud dogs. When they mature just like their dad as you can see from my photos they are stunning .If you want the best then look no further because these pups are going to be award wining, and pups of this quality do not come around very often so what are you waiting for. please contact me for more info and update photos. prefer ring only nice to speak to prospective buyers. But will reply to emails. I do not puppy farm my dogs I am a genuine hobby breeder. can deliver for a fee. .
New litter ready early October 2015. Just to provide you with a little bit more information about myself: I have been involved with animals all my life, am also a dog groomer We are a family of yorkshire terrier breeders I have bred Yorkshire Terrier Puppies for a number of years now and pride myself on delivering a high standard of beautiful puppies. My puppies are bred for size, temperament and looks. As you can see from the photographs in my gallery my dogs/puppies are adorable. My puppies have made great family additions to many families throughout the UK and i have received much positive feedback. Testimonials can be read on my face book page. All my dogs are well cared for, and loved, and share my house with me pampered and walked daily. My dogs are also fit, healthy and very happy.and in tip top condition. My puppies are very well bred pups with champion pedigrees pups of this quality and size do not come round very often. Not to be missed. Pups are very small miniatures . Adult weight estimated around 1.5876 kg to 1.814kg 3 1/2 to 4lbs. Miniatures around 4 1/2 to 8lbs I sell my pups for pets or companions only even though some are and have been of show quailty and made the show world. if for any reason what so ever you can no longer look after puppy or it does not work out my policy is we must have first refusal. we will gladly have puppy back. Please remember i am always available 24/7 if you ever need me thanks you Benjy my proud stud dog is Kennel Club Registered and has many champions within his pedigree. Sadly Is now retired. I also have 2 new stud dogs as Benjy is retiring now is is 9 years old. My new stud dog is Jankeri red devil proven stud pet name Buddy. with 20 champions in his pedigree the janker. Buddy has sired best litter of 9 beautiful pups in Blackpool. June 2014 Making him the best stud dog in the North west Also Apollo is a Tri coloured beautiful colour and markings is long silky coated proven stud bred out of the Biewer beautiful dog fabulous temperament credit to his breeder bred in Birmingham. both dogs can be seen in my advert. Has sired best litter of 7 beautiful pups. I am now the proud owner once again of Mondlindis snug fit pet name Snugy KC reg also a beautiful litter dog bred from show winning lines, sired best litter of 7 beautiful Toy T cups miniatures. If you would some more information or are interested in becoming the proud owner of one of my beautiful puppies, then please do not hesitate to contact me. New litter born 2015 2 females 3 males Dad Mondlindis Snug Fit (Snugy) mum vergo Missy of ceder if you would like to reserve one of my beautiful pups please contact me Thank you for taking the time to view my profile.